A few years ago, IBM Systems Magazine did some interesting research on the characteristics that led to a successful software implementation.1 The findings were somewhat surprising. Of the deployments analyzed, over 50% were considered “unsuccessful” – having not met their original goals. Even more surprising, of those that failed almost none (3%) were due to technical challenges. Having led enterprise software implementations for several years myself, these themes were not unfamiliar to me. Very frequently an implementation team is so focused on the technical challenge in front of them, that the other business or user related items can take a back seat. Recognizing that the most critical implementation success factors are often those that are least discussed when planning an implementation, the aPriori Professional Services Team has developed a Cost Maturity Index (CMI). The CMI is an assessment tool which combines decades of experience over hundreds of cost management software implementations, anonymized customer feedback, and in-depth industry research on the critical factors leading to a successful roll-out and continued success. 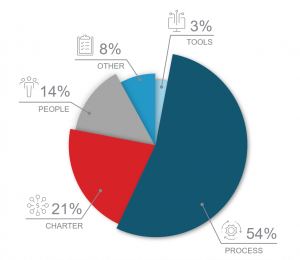 Our tool measures an organization’s product cost management maturity across domains that directly impact success: charter, people, process and tools (each briefly described below). People: Software is generally intended to increase efficiency and provide broader capability to the masses. Understanding the existing expertise within your organization and how it can be best leveraged to support a deployment is a key determinant of success and long term adoption. Process: Business processes are key to achieving organizational objectives and ensuring consistency. Without an understanding of the existing process and a clearly defined impact plan to support a new technology churn and variation in outcomes are a certainty. Tools: Today’s software generates and stores an unprecedented amount of data. Understanding how this data needs to be formatted, shared with the organization (or other tools) and ultimately used to drive business decisions is a key consideration and must be carefully planned. Completing the CMI tool and analyzing the results, gives the respondent an improved understanding of areas of strength and opportunity both in the absolute sense and in comparison to others in their industry. When your scores are generated, you may notice that you aren’t quite where you thought you were. Perhaps you exceeded your expectations, and surpassed the Best In Class for your industry, or maybe you fell a little behind. There are two key takeaways here. First, everyone, even the highest scoring Best In Class companies, have areas for improvement. A holistic view of one Best in Class company, for example, shows that they scored highest in the charter category. 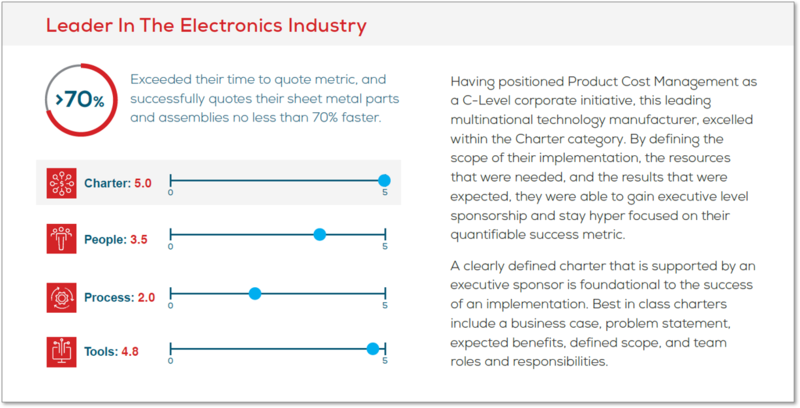 With a score of 5.0, ranking highest among the electronics industry, they saw tremendous success as a result of their executive level support. What they lacked however, were the required attributes to succeed in the process category. Scoring a 2.0 in process, the CMI survey allowed them to expose an area of imperfection and realize a large margin of opportunity. Second, the CMI survey can be taken from an unlimited number of team members at your organization. While your scores might paint one picture, others at your company might see different strengths and weaknesses. A recent customer of ours had roughly 10 engineering managers across their organization complete the CMI evaluation. Once they compared all the responses, they were able to understand where there were pockets of excellence across different business areas. Later, when they were in a position to exploit these areas of excellence, they were able to benefit the enterprise as a whole. Completing the CMI tool also facilitates a transparent and deliberate planning process for new and existing deployments. Once the questionnaire is completed, we are available to review the results with every respondent, and work together to co-develop a plan that addresses the areas that were lower than desired. With one customer, for example, this exercise highlighted that we didn’t have a level of executive sponsorship to fulfill their vision of a complete deployment within engineering. This customer had been very focused on creating the best technical solution for their teams, but hadn’t considered who would be required to drive the solution throughout the organization – not an uncommon oversight looking at IBM’s data. After a period carefully planning and identifying who the appropriate sponsor would be, the customer team approached the individual highlighting the capability, successes that had been had to date, and why it was in their collective best interest to deploy enterprise wide. As a result of this exercise and follow up activity, they now have a very engaged executive level sponsor, are currently deployed throughout engineering, and experiencing an ROI beyond their initial target. By understanding the maturity level within each of these categories and having clearly defined implementation objectives, one is able to create a tailored plan to not only drive technical success, but also ensure the desired long term value delivered back to the business.